Vows, or words of love, are placed inside the wedding vessels, or ceremonial vessels. I sculpt the vessels in clay then make a mold, which I cover in handmade paper made from abaca pulp, dyed with pigments. I use layers of chalk pastels on the surface. 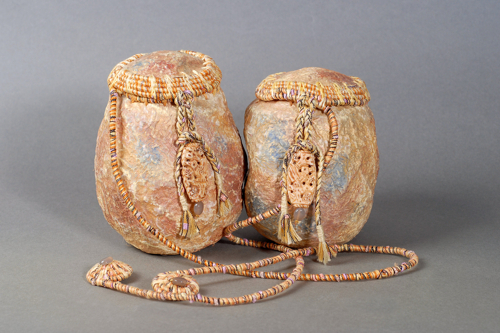 The rim of the vessels and the lids are woven with cord wrapped in threads. I fasten the lid to the base with semi precious stones and braided threads. The vessels come in a variety of colours. 6 inches high x 13 inches in circumference.